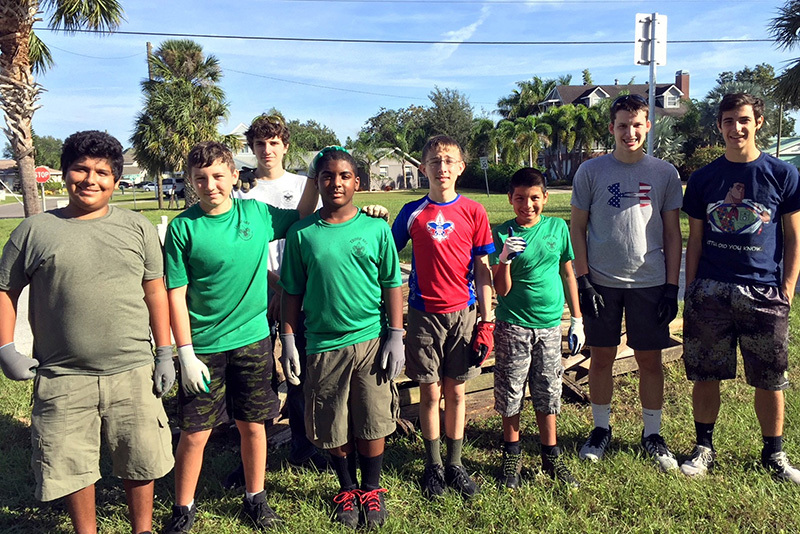 Members of Boy Scout Troop 661 gather for a group photo during a break from their recent service project at the Apollo Beach Park. From left are Mark Cardoza, Travis Smith, David Aussendorf, Shmar Christian, Matthew Leonard, Matthew Cardoza, David Amshel and Connor Mortus. 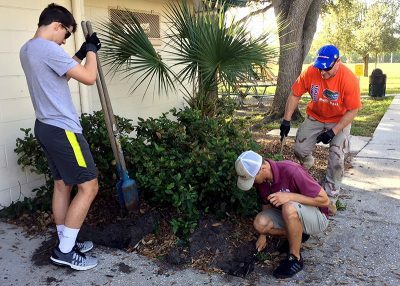 Members of Boy Scout Troop 661 spent their entire Saturday Oct. 21 performing a special service project to benefit the residents of Apollo Beach. They removed an aging border fence within the courtyard at Apollo Beach Park and replaced it with a completely new structure, first by digging up the old wood, posts and cement, and then replacing it all with materials and supplies purchased by Hillsborough County Parks & Recreation. 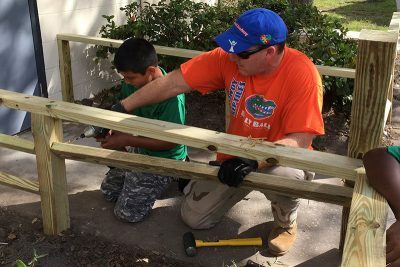 Park supervisor Raleigh Barnes and troop leader Robert Leonard oversaw the effort, which was guided by adults and carried out by the scouts themselves. The project was not part of the county’s annual budget, Barnes said. Troop 661 meets at Calvary Lutheran Church, 5309 U.S. 41 N., Apollo Beach, Mondays at 7 p.m. It’s open to all boys ages 11 to 18, regardless of race, economic status or special needs. New members are always welcome. Eagle Scout David Amshel, 16, left, Apollo Beach Park supervisor Raleigh Barnes and David’s father, Craig, prepare post holes for the border fence Boy Scout Troop 661 recently built as a service project at Apollo Beach Park. Dr. Craig Amshel, an Eagle Scout, guides 12-year-old Matthew Cardoza as he uses a drill to attach a wood plank to the post of a border fence Boy Scout Troop 661 built for the Apollo Beach Park Oct. 21. 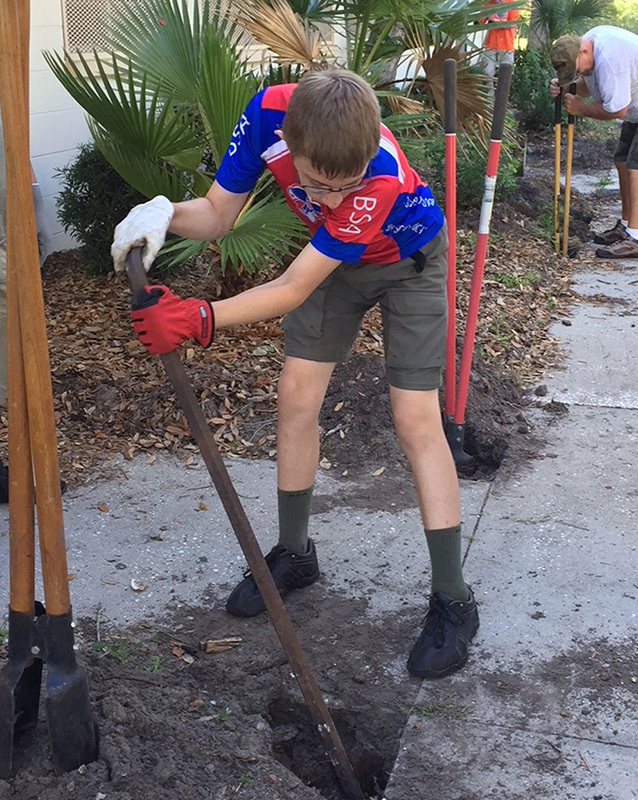 Right, Matthew Leonard, 13, team leader of Boy Scout Troop 661, uses a post-hole digger during a service project his troop performed Oct. 21 for the benefit of the Apollo Beach community.